A reader wrote that he's become interested in educational Sloyd and noticed that there seem to be no current texts offering modern context or commentary. I guess that's one of the things I need to put on my list for later. If, in the meantime, you would like to become better acquainted with the system of woodworking education that began in Scandinavia in the mid to late 19th century, there is no better place to start than B.B. Hoffman's book The Sloyd System of Woodworking which can be downloaded from Google Books. The reason I like Hoffman's book is that it offers a brief history of manual arts training as to how Sloyd was developed and the rationale behind it, in addition to sets of models which describe the gradual development in the child that was to take place. One of the things that might surprise readers is that Sloyd is not necessarily an easy thing to get one's hands around. It was much more an educational movement than a fixed point in time, and that movement has continued in Scandinavia, even to this day. Today in the wood shop, I've mitering corners for boxes. So far I have cut corners for about 80 boxes and now have less than 4 times as many more to go. As you can see, I've also begun assembly, using large rubber bands as clamps. Over my years of making boxes I've made thousands of boxes, but never so many in a single month before. One of the things an author must do when proposing a book to a publisher is to research and discuss competing titles, and this kind of investigation has been made easier by Amazon.com. Of course, no book would be exactly what mine or yours might be, but "competing titles" will give a publisher the sense that there is an interest in the subject area and that those books have done either poorly or well. A comparison of existing literature also helps a publisher to get a better sense of the proposed book, how it compares to other books in the nearby subject area. Many books dance around the matters discussed in this blog. But my point is to make things concise, meaningful and direct. We learn best, most easily, and to greatest lasting effect when we learn through the agency of our own hands and with the participation of our full range of senses. Today in the wood shop I am mitering box sides for 300 small boxes. I have to keep the sides in order as they are cut so that they can be assembled with corners that match. Over 100 box sides waiting next step. I have begun work on a large corporate gifts order the destination of which will remain anonymous, as is of necessity the nature of such things. There is no reason to spoil a surprise. In any case, it involves 300 boxes, and the opportunity to put another person to work who is attentive, a hard worker, friendly to be around, and enjoys working with his hands. Four hands can lighten the load, make production work less daunting, more fun, and go more quickly. 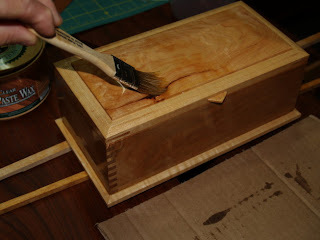 It also allows me to share some of what I've learned about box making. At one time, not long ago, it was proposed that we cease being a manufacturing nation. We were to be a "service economy," and then when folks realized that the high point of that would be to flip burgers, we (meaning the minds at the top) decided our nation would become "an information economy" in which we would thrive (those at the top) by trading bits of information and gaming modules that would keep the masses (those at the bottom) endlessly and mindlessly entertained at little cost. Schooling would be about keeping kids off the streets and safely under control and not about raising human capacities and interests. Who cared if the kids were geographically challenged, knew nothing about world events and cared nothing for mathematics or science? All I can say is crap on that. This is a new program so not a large public high school. I think being able to accommodate 20 students is good, they will normally not be in there at the same time. 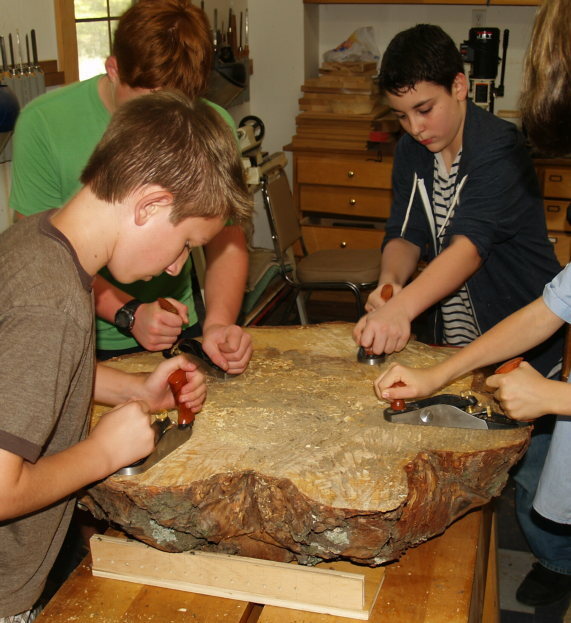 The model for the school is for kids to be working in groups of about 5. Tell me more about setting up a shop which is just hand tools verses having power tools as well. My gut says power as well. I will not have a teacher for a while still, just trying to get a sense of costs. Also trying to understand insurance for this type of studio. Perhaps my response would be useful to others, or if you have ideas you can participate in the comments below. For your school, a shop like mine would probably suffice. Two rooms, each about 600 square feet, one for machine work and one for workbenches, lathes and hand tools. I can't tell you much about the insurance except that our small school can afford it. One of the deceitful rationales they've used for years to get rid of wood shops is the cost of insurance. It should not be the deal-breaker. Whether your primary focus is hand tools or power, power tools can be useful for materials prep. 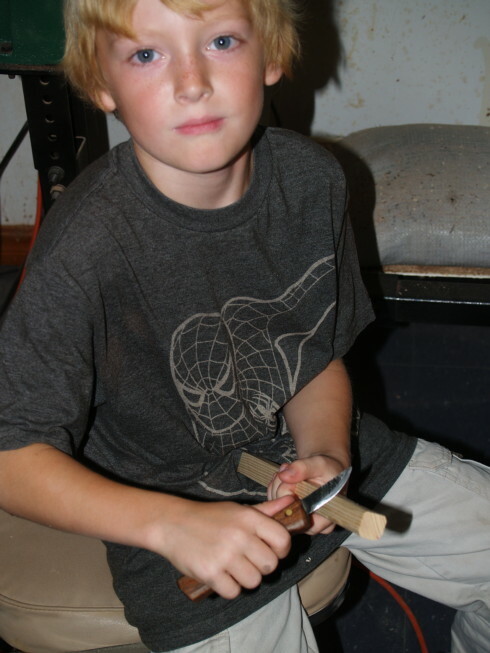 But a skilled traditional joiner like Peter Follansbee could build a program on hand tools alone. These days, programs need someone who has a sense of the vision of where the program is to go... someone with more than an academic interest. You might want to look for that person sooner rather than later. Having an academic understanding of the value of woodworking education is not enough to bring a program on-line. There are advantages to working with hand tools, as they do more to invite deeper investigation and understanding of materials, methods and even the functioning of the body. Power tools are distracting due to the noise and dust, are less convivial in their use, less inviting of conversation and camaraderie. Hope this helps. Today I pick up materials for a large corporate gift order for boxes made from native hardwoods, and will also take the students of CSS through a mini course in knife safety as preparation for camping next week. Today, the first, 2nd and third grade students practiced their wood carving skills, and made tops. The 7th, 8th and 9th grade students met me at the library to attach tags to the tulip poplar tree at the library, correlating its rings with major events in city history. The following is a public announcement. All artists and educators, and those who see the value of the arts in education are invited to attend a presentation on the integration of the arts in schooling at the UU Fellowship 33 Elk St. Eureka Springs, Sunday, October 14, 1:30 PM. Paul Leopoulos, founder of the Thea Foundation will introduce A+ Schools, a program started in North Carolina which purposefully integrates the arts in education to improve academic standards and energize learning. Year after year Eureka Springs has been named one of the top 25 arts destinations in America, and now with addition of Crystal Bridges Museum in our neighborhood, the importance of the arts in Eureka will no doubt continue to grow. We have more professional and semi-professional artists here than in any other small city in America. We also have some good schools that do their best to conform to state and national standards. But as a community in which the arts have such importance, are we all that we can be in education? As good as our schools may be, is there not still room for vast improvement? Research has shown that students engaged in the arts perform at a higher academic standard. What if we were to apply the artistic resources available in our community to the education of our kids and have schools that truly reflect our national standing in the arts? Knowing more about A+ Schools in Arkansas might be the best place to start. If you care for the arts, and care for education, please attend. The elements of design consist of a set of conceptual tools that assist artists in the development of meaningful work, and should be even more meaningful to teachers who realize that engagement of the senses is the most effective tool of education. Points, Lines, Planes, Shapes, Focal point, Scale, Texture, Value, Color, and Space are descriptive of things you can sense with eyes, ears and hands. This should not be hard for any but the most obtuse to understand. If we are to teach children well, we must use their senses to gain their most thorough and lasting attention. The last principle of design to discuss in relation to education, and the role of teachers as artists is contrast. In 2-d design, we naturally think of contrasting colors and their use to enliven a painting. 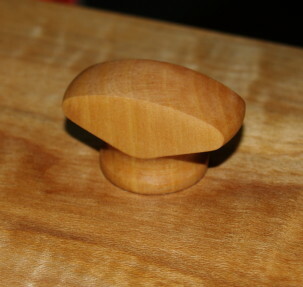 In woodworking, we often use contrasting woods to make our work more interesting and engaging to the viewer. So, as designers of paintings or of things, we know the value of contrast. So, too, do effective teachers know the value of contrast. We know that when a child has been sitting, he needs to rise and run, and then when a child has risen and run, a bit of quiet story time is in order. We know that "compare and contrast" is one of the valuable tools in developing intellectual and emotional understanding. We know also that the child that leaves our care at the end of the year is more mature, more confident, stronger of stature and stronger of intellect, than the child who came to us at the beginnings of the new year of school. We do not need standardized testing to tell us of these things. But we do need one of those very important tools of character that artists, craftsmen and teachers share... that of deep caring and concern for the development of the materials at hand. And in the case of children, they are of greater concern to all of us than canvas or wood. Today, I am beginning work on a large corporate gifts order that will keep me very busy for the next month. I will try to keep my blog posts at a minimum in order to keep my real work flowing at maximum capacity. I had promised to offer insight into the elements of design, the conceptual tools used to put the principles firmly in place. That will wait for a later date. For now, I will mention them, as any artist, craftsman or teacher can explore these on his or her own. I will state that these things enliven work: Points, Lines, Planes, Shapes, Focal point, Scale, Texture, Value, Color, and Space. In 3-d design, proportion can refer to the size and usefulness of the object. Does it hold the things it is intended to hold? My those table legs are fat, or that part looks so thin and weak! Will it break? In 4-d design like that a teacher would use in developing a lesson plan, other concerns having to do with time come into play. Can we make that start to finish in one day? Or is this activity age appropriate for my students in their natural development? Is this a suitable exercise for this individual child? In education, we've hired experts for that and essentially divorced many teachers from the knowledge of child development. Otto Salomon in Educational Sloyd described the special understanding held by teachers as "educational tact." It is a special knowledge and sensitivity to the needs of each child that comes from mentoring and careful observation. At one time, education was reliant on observation rather than statistics. For instance, my Kindergarten teacher mother could tell if a child was ready to read by observing whether he or she could skip, which served as an indicator of cross-lateral brain development. But in modern American education, teachers have become curricula delivery mechanisms, too often untrained in subtleties, expected to go through page by page scripts, delivered by the book, with little sense of observed reality. If a teacher does notice a child at the margins, he or she is to refer that child to a specialist, so the child does not interfere with effective delivery of prescribed content. Sorry to be so harsh. Most teachers make a profound effort against and amidst difficult circumstances. It's with the current teach-to-the test model of public education that I find fault. When we fail to see teachers as artists and remove from their training, the essence of design, and instead become reliant on a statistical model, far removed from the children at hand, we are destined for educational failure. We may take comfort in the children who soar from the experience, but then allow to languish as unsuccessful outliers, those who do not. Today in the CSS woodshop, my 4th, 5th and 6th grade students will be making bird feeders, and the high school students will be finishing their computer cabinets and working on cutting frets for their cigar box guitars. Lest we get exclusively cerebral, it should be noted that researchers who were recently awarded the Ig Nobel Prize had measured brain waves in a dead salmon. How long the fish was dead, I cannot say, but does this tell us that the matter of our hands now dangling uselessly at the ends of flaccid wrists is no longer a problem in American culture? As we wander around in real life (we have to have feet for this unless we are only wandering in mind alone), it is useful to have hands. You may have thought I was getting away from what I had mentioned I would discuss: the principles and elements of design. Balance is an important principle of effective design and I again offer the box shown in the photo above as a concrete example for the examination of design. 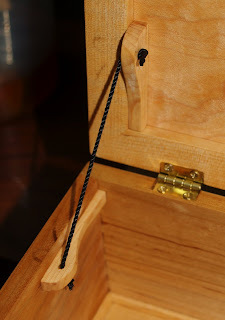 You will note that the hinges are not the same length, but rather one is cut short to fit the design already inherent in the material used in the top. If that wood were a kid, in most schools he or she would be thrown out. But balance is not the same thing as absolute symmetry. There is some symmetry in the piece. The pegs on the left and right are symmetrically placed. 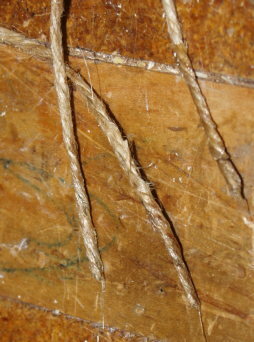 The knot (there is a corresponding one on the back) is offered as a focal point with roughly half of the box on each side. But balance is more than just symmetry and order. And too much symmetry and order arbitrarily imposed on craft work or education leads to some boring stuff. In art and craft some works are deliberately asymmetrical to create meaning. 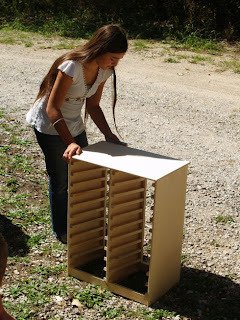 In any case, good design works with what's there inherent in the materials, and schools in America operate in too many cases, as though the children were made from particle board, without important qualities that make each child unique. And working successfully with unique materials requires the hands of an artist. These days, balance seems to be a thing thrown out the window in too many schools. The balance between work and play is all in the wrong direction as schools cut recess and limit class engagement in the outside world. There is an essential interpretive understanding that takes place in the heart and mind of a successful teacher, that tells when it is time to take a break from lessons and that all kids must go outside and play. Balance is too often a thing taken out of the hands of teachers and put in the rule books reflecting school board decisions made at monthly meetings and unrelated to what actually transpires in the minds and hands of kids. If we were to commonly understand teaching as an art and that the principles and elements of design DO apply to teachers' work, we would have far greater educational success. 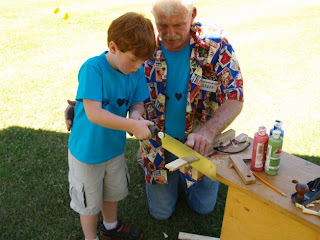 Working with children is akin to working with real wood. 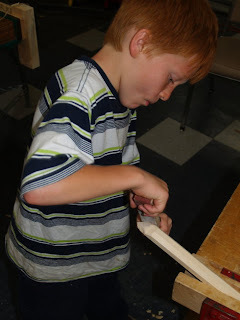 Just as a craftsman adapts his design to the material at hand, thus making the material far more beautiful and interesting, teachers should have the same opportunity to adapt lessons, curricula, and even schools themselves to allow the materials of their concern the opportunity to grow as creative, competent, compassionate and skilled human beings. The Ig Nobel awards are given to those who do incredible seemingly senseless things. They might seem like a joke. A number of past Ig Nobel winners have gone on to win the real Nobel Award in their field. We don't always get where we are going most efficiently by taking a direct path, but rather by finding balance, having fun even at the expense of dead fish. As you can see, the hands have the power to step in where other senses are impaired. The click rule shown in the second video would be of value to anyone attempting to do precise work. This afternoon I take workbenches, tools and supplies to Eureka Palooza, a Clear Spring School sponsored music festival where I will do woodworking activities with kids. Then this evening, I will take benches and tools to a solstice walk where I will be one of the senior mentors offering "wisdom" to participants. I, of course, will offer the opportunity for attendees to garner wisdom from their own hands. Harmony is the second principle of effective design whether we are talking about 2-d, 3-d or 4-d as in design of curricula, schools, classroom activities, etc. Harmony in a classroom or working situation is not necessarily a whole bunch of folks doing exactly the same thing. In a harmonious classroom, or in an object or painting that expresses harmony, there are variations, coordinated by design to work together. In thinking about harmony we realize that teacher's job is far larger than some might think and has to do with what goes on inside and outside the classroom doors. Even how a teacher may be regarded within the community at large is a matter of importance. Reader Mario in a comment to yesterday's post mentioned his feelings at the head of the class when things were going just right, those of being a conductor of an orchestra. If only teachers in our society could be held in such high regard. For simplicity sake, and with deep regard for the theory of Sloyd, we can use the concrete to examine the abstract. This box at left is one of my favorites. Just as a musical composition uses rhythm to engage the listener, this box uses rhythm to visually engage and incite touch. 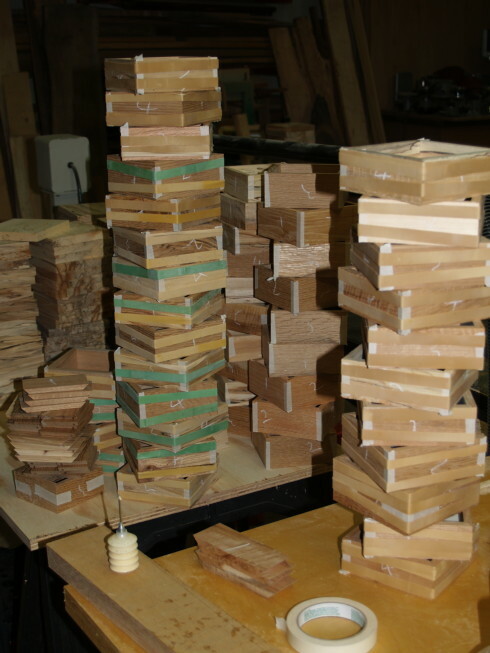 The pegs holding the box together are arranged in an orderly, rhythmic manner. 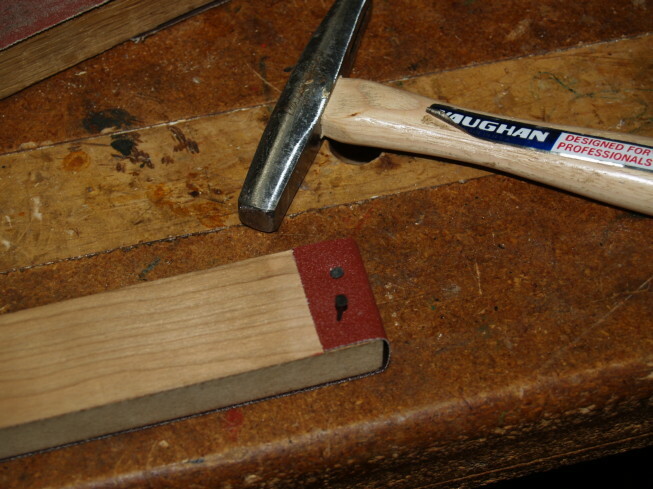 As a percussive counterpoint, careful gouge markings that provide texture on the hinges, edges and base also establish a sense of rhythm, more chaotic than the bass note arrangement of pegs. And yet the two rhythms engage in harmonious discourse. Rhythm is one of the design tools used in 2-d, 3-d and 4-d design to help establish both a sense of unity and harmony within a painting, a box, or a classroom activity. This box also offers an example of the harmonious use of color. The spalted hickory and walnut used in making this box are strikingly dissimilar in color, but while the walnut is a uniform rich red-brown, the hickory grain expresses that same color as lines of grain on a background of a contrasting tone. The colors of the woods used in a piece need not be exactly the same to convey a sense of harmony, just as all voices in a choir or orchestra must not be exactly the same tone. The variations in the color of the hickory actually extend a clear invitation to the woodworker to use walnut as a contrasting wood. The richness of a classroom experience is also based on harmonious expression of diversity. For contrast, consider the very old method of classroom recitation learning, where all the students were required to repeat exactly the same words or numbers at exactly the same time, to learn by drilling information into their heads. A third element of design used in this box to create a sense of harmony is that of movement. Lines of grain encircle the knot, and lead the eye across the piece giving a sense of flow. Harmony in a classroom must be going someplace, in a direction that each student and the teacher can grasp and understand, and toward which each aspires. 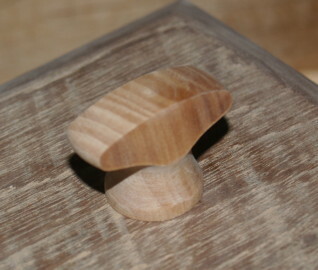 A sample for a corporate gifts order, walnut and white oak. Taking a hand-centric view, that regards teaching as an art, invites the use of artists's tools into the discussion of where we are going in American education. We all know the difference between 2 dimension as in painting and drawing and 3-d as in useful objects and sculpture. 4-D is about designing a thing or a relationship that is fluid over time, like a school culture or a curriculum or classroom activity. It might be helpful to take the principles and elements of design and go point-by-point how they could be utilized in a hand-centric redesign of American education. I mentioned effective surprise as being one goal of good 3-d or 4-d design. I don't know how much time I have to make a daily commitment to this, so it will be brief. It is ironic that artists would have a systematized view of good design, while educators would not. Can it be that art is closer to science these days than education? Boxes can serve as concrete examples to illustrate design. Today I will concentrate on unity, one design principle (goal) from the list: unity, harmony, contrast, proportion, rhythm, balance and effective surprise, and leave the elements of design (tools), for future posts except as they can be conveniently woven in. It is easiest to describe the principles and elements of design if using concrete objects as examples to provide a sense of the abstract, so I offer the photo of boxes above as a concrete starting point in the discussion of unity. The box is shown with routing on the right and on the left without. The routing at the bottom of the box provides a shadow line around the base, suggesting that it is separate from that upon which it rests. 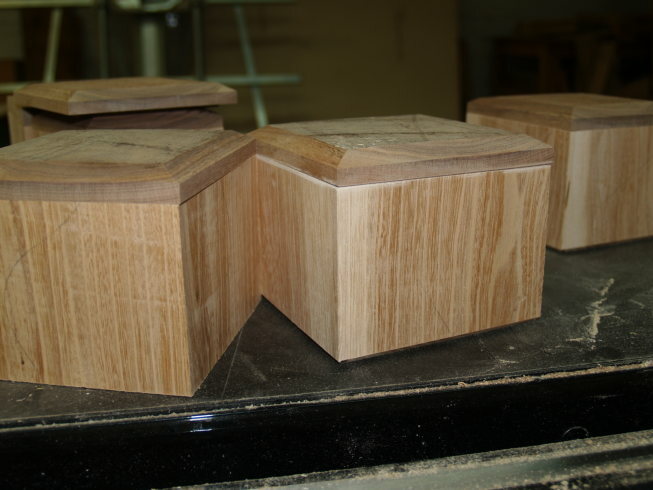 Some care in matching woods (color and line) at the corners of the box give a sense of unity to the box itself. The lid is obviously separate from the body of the box, with a clear line where it will lift apart, but the edges of the lid align with the edges of the body of the box. These design elements create a sense of unity in the box, and define that unity as being separate and distinct within itself. In education, the principle of unity is important, as each child must be encouraged to feel a significant part of things in order for effective learning to take place. The child must feel a part of the school, the class, and have a sense of shared purpose within. For effective learning to take place, the child must be woven into the group, into relation with the school and teacher and peers. This is not always an easy thing, but on the child's sense of unity, all else rests. Just as in a box, unity is established through the use of lines, color, shape, texture, groupings of parts, within a classroom, arrangements can be made to include and make all students feel part of a thing larger than themselves. Creating a sense of unity is dependent on strong values and character education, concerning respect for ideas, and individuals within the group. One of the challenges in most schools is classroom size. In large classes, teachers often have little time to draw in those at the edges of participation or to create a sense of unity. Many politicians these days as they cut school budgets and attempt to force school reform on local communities will tell you that class size doesn't matter. It does. After I have gone through the goals, and explained them, I will offer blog posts explaining the tools designers whether teachers (or artists) can use to attain them. And or course, I am going out on a limb here. I had never heard of the principles and elements of design being applied to teaching before. Are you with me? American craft magazine this month offers an article asking, "Is the Future of Craft in Design?" with the question really being, should craftsmen hire others to do their work and implement their vision and thereby remove themselves from the tangible creative process? I suggest that understanding the principles and elements of design through an exploration of concrete objects is useful regardless of which path you would choose to take. And as for myself, I choose the path with the maximum engagement of hands. My own. Today I've been getting ready for Eurekapalooza on Saturday and making prototype boxes for a possible corporate gifts order. The prototype box is shown at top. 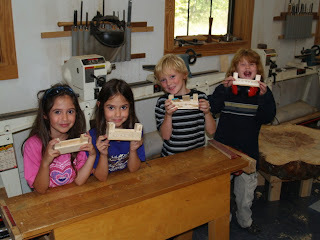 This morning in the CSS wood shop, first second and third grade students made desk organizers as shown at left. 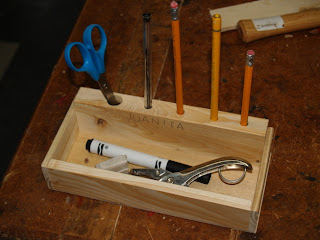 Each had room for two pencils, note cards, and eraser and folding foot long ruler. Seventh, 8th and 9th grade students finished their low dining table made from a pine stump, and we applied finish to the computer cabinets which will be used to hold and charge laptop computers in the middle school and high school classrooms. Of these elements, some apply more to 3-d objects and educational experiences than others. At this point, I have only opened this door a small crack, but wanted to show that the principles and elements of design, as I mentioned in yesterday's post, offers the potential of rich educational design. Just as an artist may use the principles and elements of design to evaluate and improve his or her own work, a craftsman or educator can do the same thing. If you notice the richness of the language, you will see something of what is lacking in too many schools: texture and color. Kindergarten as it first came into vogue in the late 1800s made an early start in the use of color as it made some of the first attempts to make the educational experience a rich and visually fulfilling one. For many reasons, that richness of educational experience rarely makes it past 2nd grade. And too many students lose interest, become discouraged, or even disruptive and drop out. First, I cannot help but respond to news of the US presidential campaign by saying that 47% of Americans are not moochers, and do not see themselves as victims. Many of those who do not pay federal income taxes, do pay social security taxes at a 15+ percent rate (federal taxes higher than many rich folks) and thereby support the retirement of the current generation of retirees, and as workers, contribute to the success of American corporations and small businesses. On the point of those 47% being dependent on government, I would like to point out that we are ALL dependent on government, 100 percent of us. Without roads, without law enforcement, without national defense, without public education, without some level of social safety net, and without civic ordinances and compliance with those ordinances the United States of America would be a pretty sorry excuse for human society. Governor Romney, on the other hand, says what he meant was not elegantly stated, but he stands by what he said. If ever there was a more out-of-touch presidential nominee, I would be surprised and amazed. But not all surprise are effective. However, comments disparaging nearly half the electorate may turn out to be both surprising and affective... Leading most of us deeply insulted. Give the man a wrench and see if he can turn a bolt. Lefty-loosey, righty-tighty. Can he possibly be one of those untrained by personal experience in the use of his hands? There is a relationship between idle hands and ignorant, out of touch minds. One of the important principles of design is that of "visual illusion" but please remember that the principles and elements of design were intellectually crafted as a guide for visual artists. When you get into 3-D design, or become engaged in curriculum design for schools, the same principles and elements of design apply, but with some adjustment. Instead of "visual illusion", substitute the concept "effective surprise." While visual illusion may lead the eye into a painting, it is surprise that leads a casual viewer into participation and engagement with either an object or process. I also mention "affective" surprise because whatever happens in the work should affect the emotions as well as the intellect of the observer or participant. I used a simple turned knob design the other day on a series of boxes, taking a thing that was commonplace, instantly recognizable but reshaped through a simple though delicate sanding operation. The instantly recognizable requests no further investigation, but that which incites curiosity leads to deeper engagement. This is a simple principle to understand, a sometimes difficult principle to put into practice. Just as a painter may require advanced skill to create visual illusion, makers of things and planners of curricula, must think outside the box in their efforts to surprise. If there is one thing in particular troubling American schools it is the consistent lack of surprise. Humdrum, boring, routine. If it does not surprise in at least some simple way, it is not good design, and teachers whose hands are tied to tightly by administration do not engage children's minds in learning. Today in the Clears Spring School wood shop, the upper elementary students made desk organizers like that shown below. The high school students began making the fret boards for their cigar box guitars. 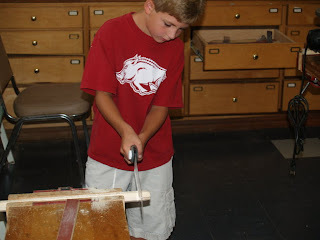 Among most useful tools in the Clear Spring School wood shop are our sanding sticks which consist of pieces of wood wrapped in sanding belt held in place with common upholstery tacks. Each year at this time I replace the sanding belts. 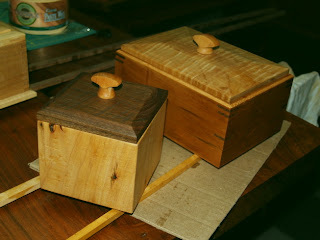 new pulls, new boxes, Danish oil brings out the beauty of wood. One of the things I must do in getting a publisher to work with me on a book about hands-on learning is to convince them of the urgency of the situation. So here I'm practicing my case. The overall thrust of education in the US is toward computer technology, making the learning experience virtual and manageable by IT specialists who like their "students" will log in on keyboards or iPads and manage learning. Just as one person can watch over the self-checkout at Walmart, performing the task of several regular check-out clerks, the idea is that a smaller number of check out supervisors can manage a much larger number of students in school. There are model schools financed by major investors where all is to be taught by computer games, capitalizing on the addictive effect of gaming to create student interest. While that may be an extreme, the thrust in most schools across the board is toward greater efficiency in learning as we attempt to cash in on the computer revolution. Much of the thrust is planned by corporations that see education as the next great business frontier if only control can be wrested from teachers unions and community school boards. Millions of dollars are being invested. The primary means of enforcing growth in the marketing and implementation of computers and software in American education is the standardized testing industry. All educators with any sense of honesty about what they are doing will state this fact: Standardized testing is a poor measure of what children have actually learn and a poor predictor of children's potential for success, of those things have as much to do with aspects of character as with measurable knowledge. In this matter, I will ask you to refer back to yesterday's post, Make it really for real... There must be an urgency to my message because despite educator's best intentions, we in American education are being driven off a cliff. The forces of vast wealth, seeking even greater wealth are pushing us toward the brink. Children learn best when they are offered the opportunity to learn from real life. There is no educational virtue in virtual learning. Experiences crafting things of useful beauty involve depth of character and touch the heart, mind and soul of the child. This view was reinforced by a program on NPR this morning that described lab rat mothers licking their young to build in a sense of resiliency that built greater character, confidence and intelligence. The program link is here: 'Children Succeed' With Character, Not Test Scores. A good teacher is a lot like a mother rat. He or she soothes, builds confidence, helps to overcome stress, helps to build in the kind of emotional resiliency that can assist the child through a life-time of challenges. Readers in the Boston area should check out the current programming at the Eliot School. They have a full set of woodworking classes scheduled for kids ages 4-17 and and evening presentation, Slow Cloth and the Fabric of Society by Leonore Alaniz who links fiber arts to the slow foods, slow living community. The very best things are not those most quickly arrived at. Today I have been milling mahogany for making fret boards for cigar box guitars. The high school students will begin cutting frets tomorrow. The boxes above show my new design turned and reshaped pull and a fresh coat of Danish oil. If you look close you will see that I missed a spot. 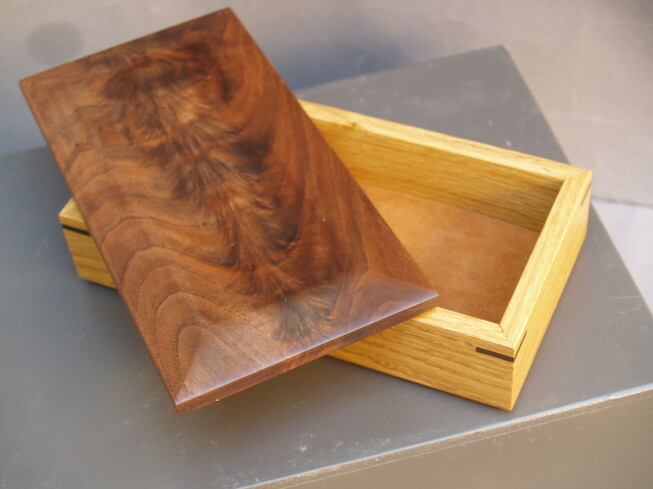 I've applied a Danish oil finish to my new box, and still have time for many other wonderful real fun things this morning in the wood shop. As shown below, a piece of black nylon string and two pieces of wood glued to the box side and lid form a simple lid stay. Virtual learning has nothing to do with virtue. And its nothing new. Entrepreneurial educators throughout the world are trying to cash in on computer technology, but cashing in on technology has been going on for years. As technology has advanced, the media has become more enticing, and in some ways more effective and in some ways not. Pestalozzi (1746-1827) had pioneered the use of graphic images in the 1800's, but one day in his school, a student challenged his teacher. He said, "You want me to learn the word ladder, but wouldn't it be better to go look at the ladder in the shed?" The teacher brushed aside the students question. "We don't have time to go outside," the teacher said. Later as the teacher tried to teach the child the word window, the child again challenged, "Wouldn't it be better to look at the real window? We don't even have to go outside to look at it." Frustrated, the teacher went to Pestalozzi after class and asked about the incident. "The child was right," Pestalozzi said. Whenever possible, children should learn from real life through the application of all their senses. And so what are the things we tell children in our methods of virtual education? The introduction of computers, gaming, and other digital delights are not our first forays into virtual learning. I can remember when I was in college and my cohorts and I would ask each other, "What are you going to do when you get into the real world," meaning that which comes after the artificial construct of college education. These days, our virtual worlds have become so complete and compelling that we have young men hanging out in their parents basements for years rather than engaging in real life. It is my speculation that when we present children with a constant diet of the artificial, we deny the value of what is real, we tell them that what is real does not matter, and thus direct their development toward that which is lacking in true virtuosity and virtue. One of the great things about having manual arts in schools was that they allowed the students to do real things. Directing our children into lives of constant pretense, regardless of how our advanced digital technology can make it seem real, and engaging, is not the same thing as preparing them for real life. Besides making a few new boxes, I have been attempting to finish a few boxes that have for various reasons been left incomplete. 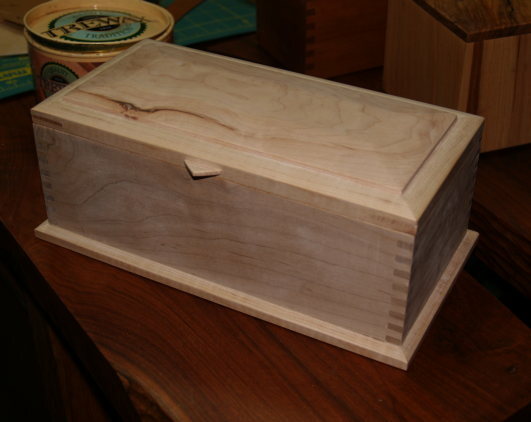 The cherry and maple box above needed routing and a pull for the lift lid. Now all it needs is a couple coats of Danish oil. 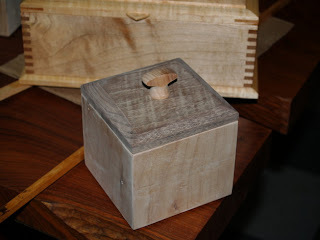 The box in the photo at left is maple with finger jointed corners. I've not yet applied the Danish oil finish. It was begun as a class demonstration in the use of the Gifkins Jig, and I finished it today by adding a lid and base. I think you can see why I might love making boxes. The design possibilities are endless. From the very earliest days of educational theory Comenius had noted that children learned through their senses and by doing. 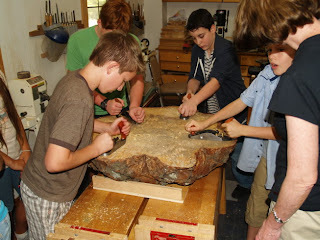 Their activities were the driving force of their learning. Since that time, things have become complicated by structured education. Children are assigned by their managers based on evaluations and objectives outside the interests of the child to teachers and placed within classrooms and while those who sit and listen well, may survive the ordeal, many who squirm in their seats do not last with all their natural confidence and curiosity in tact. That can be where woodworking, physical education and the arts come in. A significant and somewhat surprising portion of the human brain is allocated to the sensory data collection and subsequent manipulation by the human hand concerning physical and cultural realities. That we fail to make use of this natural alliance between the hands and learning is a tragic mistake. So while educators attempt to get a grasp on education reform, the secret right before our very eyes lies within our grasp. 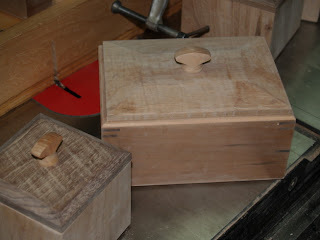 Today in the wood shop I am making boxes for fun and boxes to fill holes in my inventory. I am also attempting to write a few pages of material to hand off to an agent who I hope will lead me closer to publishing a book about hands-on learning. This morning I'm making small boxes from elm, maple and walnut. The walnut was delivered to me about 10 or 15 years ago. I heard a truck laboring up our road pulling a 14 foot trailer loaded with wood. The driver was missing a few teeth and was obviously down on his luck. He claimed to be selling the last remaining lumber from his father's "Thick and Thin Sawmill." The name of the mill came from the idea that they could cut wood thick or thin according to the buyer's preference, but the name became sort of a local joke because boards often came out thick at one end and thin at the other. After previously selling off all the good lumber, what came up my hill that day and sold cheap was what was left. Some was thick, some thin, and some both thick at one end and thin at the other and I still have some left. The texture left by being milled on a rotary mill, and the its weathered look makes it interesting to use when you realize that wood is the perfect story telling device. Where there there's a knot there was a limb, and every tool leaves its mark. A friend asked me last night if I will ever grow tired of making boxes. I suppose if I were to ever stop learning from them and finding in them the opportunity to share with readers what I've learned I might. 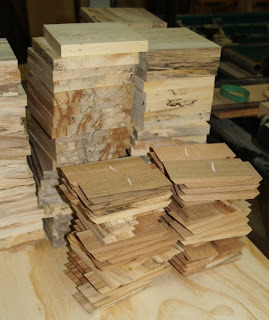 They are the perfect thing to make, as start to finish they take less time than other woodworking projects and they lend themselves to small batches, making several folks (besides the woodworker) happy at the same time. In the photo above, you can see two versions of a box, one with the base routed, and with definition lines sanded where the lid meets the body of the box. The other still offers crisp edges. One of the goals of good 3-D design is to create a sense of unity within the object, and sense of unity with the object. It should pull your eyes and interest into the object, not lead the eye and mind away. A routed line at the bottom tells the viewer it is an object separate from the table upon which it rests. Fine lines sanded in the edges of top and body of the box tell the viewer, "it comes apart here," making its use clear. I think you can see the results here as simple lines give greater definition and sense of unity to the box. Unity is one of the basic principles of design. Readers may also note that I am experimenting with boxes made with the grain going up and down rather than the conventional direction around the perimeter of the box. The advantage of this is that since all the grain is glued side grain to side grain, no more complicating joinery methods are required. School subjects are artificial constructs. The term "curriculum integration", means that traditional subject walls are pushed aside to let in a little light and enthusiasm. It is acknowledged (at least by some) that subjects themselves are isolating constructs that destroy relevance, and in an earlier time of manual arts the process of integration was called "correlation." This was correlated to that, and the terms "correlation" and "integration" have essentially the same meaning from the standpoint of education. Math is related to physics, both are related to history, and of course wood shop can be used to touch upon and reinforce learning in all subjects. I thought that was my idea, but I learned from my own study of the history of manual arts that there is truly nothing completely new under the sun. 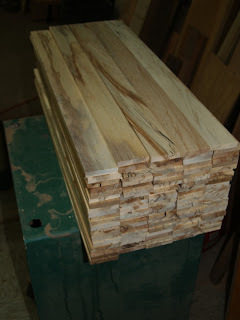 And so what I do in the Clear Spring wood shop is an extension of an earlier movement in education... Make things relevant and thus more easily learned by putting them to actual use. Wood shops are perfect for that. 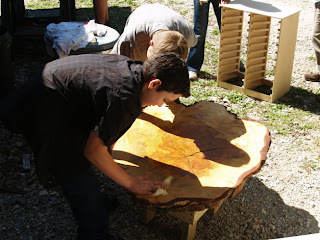 Today the first, second and third grade students made their study of local wildlife more relevant by finishing their snakes, and the 7th, 8th and 9th grade students worked on their time line of history recorded in the rings of our library poplar tree and turned the 112 year old pine stump into a low dining table for their classroom. "for all-round development of the brain, there should be in elementary and secondary education much more training of the hand, and of the power of expression through the hand, than is customary in the too bookish tradition which has come down to us from classical humanism." "Such a subject as history is too apt to pass without challenge into the circle of those subjects which are taught out of books and from a literary point of view. We have to claim it as falling into the scientific division of the course not less than into that of the humanities. And there is need in the teaching of it for the use of the hand and of the constructive powers. From this point of view, handwork in the elementary school is not so much a subject by itself as a form of expression ancillary to several branches of the curriculum, namely, elementary science, geometry, geography, and history. I suppose that under handwork in its broadest sense, one would include the free imaginative drawing, both with brush and pencil, which is a valuable accompaniment of the teaching of history to young children. Similarly, the preparation of time charts by the children themselves, in order to train the sense of time relationships, would come under the widest definition of handwork in history teaching, as would also the preparation by the children of history notebooks, in which they place their own drawings or other pictures illustrating the period about which they are learning. It is desirable that such notebooks should give scope to the originality of the children, but that they should come under occasional supervision." There are some craftsmen that worry about the loss of specific traditions. 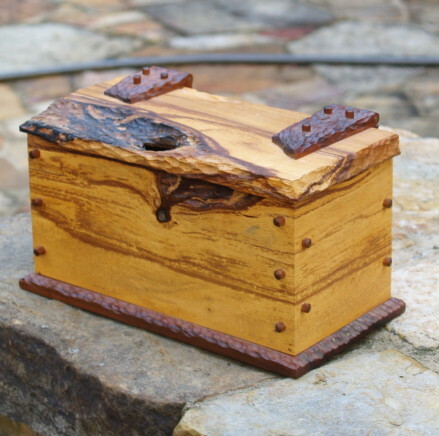 For instance woodworkers are concerned about the loss of woodworking, metal smiths are concerned about the loss of their time honored skills and traditions. But the failure to engage the hands in learning is about a deeper subject... leading ultimately to the loss of our essential human culture of which woodworking and all crafts are important parts. They say you can't push a rope. But what can one do to enable pushing a string through a small hole, only barely lager than the string itself? Apply glue, twist the end tight and then let the glue dry. Today in my own wood shop I am taking photos for a proposal for a new box making book, illustrating the use of a new dovetail marking template in photos for a manufacturer, planning for tomorrow's CSS classes, and beginning work on an article for Fine Woodworking Magazine. At one time, educators from all over the world came to the US to see our system of manual arts training. That was after Columbia University's Teachers College was founded to teach manual arts, and after Gustaf Larsson's Sloyd Teacher Training School in Boston had trained hundreds of teachers from across the US. Mr. W.C. Fletcher, headmaster of the Liverpool Institute, had written about American Schools for the Mosely Commission, 1903, which hoped to assist in the development of manual arts training in British schools. "The proper position of manual work in our schools is a problem immediately facing us, and as more has been done in America than among ourselves in the matter, I paid special attention to her methods and experience." "robbing the one of all chances of development along lines suitable to them, and leading to an exaggerated stress being put on its value in the other, besides very possibly tending to the development of class distinction between the schools." When you isolate the head from the hands in learning, both character and intellect are diminished. "they must consider the child first of all, and remember that the child was a little bundle of activities, a veritable dynamo, always charged to the full. It was the motor apparatus, the system of muscles, which really made the man, built up his intelligence and formed his character." The great shame is that too few educators make the obvious connection. When children's hands are engaged, their hearts are also. We learn most easily and to greatest and deepest lasting effect when we learn hands-on. Test hands-on learning yourself. You will then no longer need me to tell you what is true of the relationship between the brain and hands. In a recent editorial, Michelle Rhee, a controversial spokesman for education reform, admitted that poverty is one of the primary causes of poor school performance, but she insists that it not be offered an excuse for continuing failure in schools. OK, nice rhetoric, Rhee. But the difficult thing is that we've demanded that teachers be all things, most of which have very little to do with teaching... counselor, disciplinarian, child advocate, parental coach and emergency resource of last resort as children fall through mile wide cracks in the shredded social safety net "conservatives" in congress have allowed to exist. I had a chance to visit with my sister Mary while at my niece's wedding over the weekend. Mary teaches in a middle school, 7th and 8th grades in reading, computer use, and a wide range of subjects related to literacy. Most of her students come from difficult circumstances. Many suffer from low self-esteem, and many have learned not to expect much of themselves. Add to Mary's job list that of social worker and you get the idea. Yes, poverty should not be used as an excuse, but what excuses can we offer for our failure to give teachers and schools full access to the resources they need to put our students on equal footing for success? Is it reasonable to expect teachers to carry the full weight of alleviating poverty in America? Or can we get back to the basics principles of social justice and allow the government to help end poverty and allow teachers to teach? 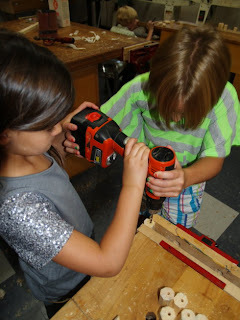 It is my theory that woodworking in schools can help all schools, whether best or worst or between overcome the enthusiasm gap that leaves children inattentive even when they are in attendance. 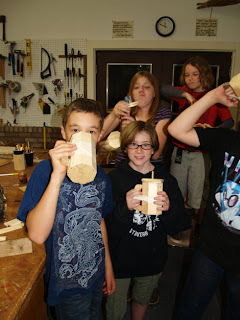 Today in the CSS wood shop, 3rd, 4th and 5th grade students finished their garbage cans and the high school students worked on computer stands, a sign for the office and planing the stump. As you can see in the photo, the upper elementary students added handles to their garbage cans so they could pretend they were also mugs. Recapitulation theory--"often expressed as 'ontogeny recapitulates phylogeny'—is a biological hypothesis that in developing from embryo to adult, animals go through stages resembling or representing successive stages in the evolution of their remote ancestors." In biology one can see resemblance between more primitive life forms and more advanced as embryos develop in stages. Complex life resembles less complex forms in its earliest stages. One of the ways that human beings are different from so many other species of animal life is that so much of our individual development is reliant on social context. And this is where Lev Vygotsky and Social Development Theory comes in, and not knowing quite how to express what I have in mind, I'll call what I'm thinking, cultural recapitulation. 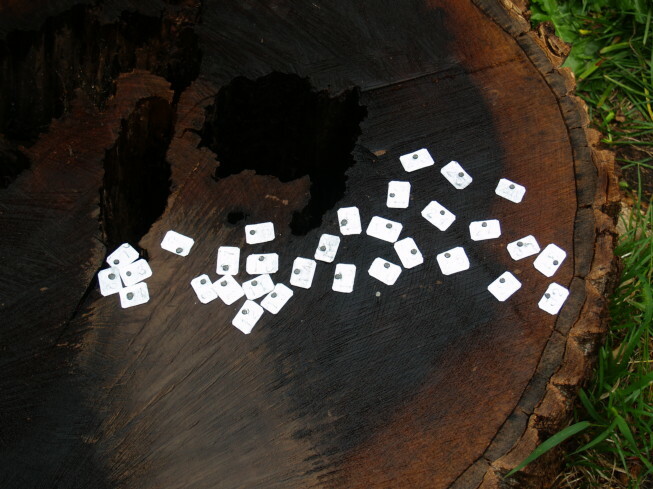 In the early days of manual arts theory and program development, many psychologists and educators believed that children would best develop through the same steps and sequences through which the species originally developed. Beginning with very simple technologies and then advancing purposefully to more complex ones paralleled the natural tendency of the individuals within the human species to follow the developmental track laid by ancestral man. 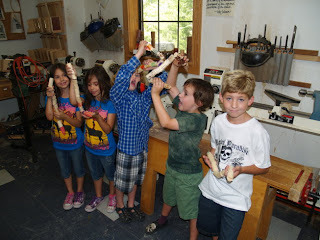 So children making and using simple tools was thought to be a way to touch the roots of our humanity. Biological recapitulation theory served as a rationale for the idea of cultural recapitulation, in which children as they developed were to pass through the same sequences of development as early man. And so, just as early man discovered the usefulness of fire, so too, each child was to discover on his or her own the usefulness of fire. So tools and processes and intellectual grasp was to proceed from simple to complex, from known to unknown, from easy to more difficult, and concrete to abstract. You really don't have to be a proponent of biological recapitulation theory to understand the relevance of this progressive development of the individual. "Let us recall to mind one of the most remarkable discoveries of modern evolutionary science, the great law that the life-history of the individual passes through the same stages as that of the race (on this point the teaching of physiology and psychology is identical); let us apply it to the present case and what will it lead us to expect? Surely that the earliest mental development of a child should be connected with manual activity and the use of constructive implements, and that this activity, though leading up to higher forms of intellectual work, should never, while educational development is still in progress, be wholly superseded." The other day, as teachers and I were discussing upcoming projects, second grader, Ana came running, asking that we come and watch, as she performed new moves on the monkey bars, expressing new confidence. It is so important in all aspects of human development that someone be there to watch, and as we were there watching closely, she would hang with one arm thence and swing her legs over the bar and hang upside down with her arms dangling. It is fascinating to watch as we have learned to observe that new levels of physical expression parallel new levels of intellectual expression and understanding. Which come first, chicken or egg? Who knows. Chicken and egg are parallel expressions of the same phenomena. Today I had the pleasure of visiting another woodworker in his shop, to see his work and observe how his tools are arranged. It seems we all do the best we can with what's available to us. And the advantage of being an experienced woodworker is that I can learn so much from what others do. Constructiveness is another great instinctive tendency with which the schoolroom has to contract an alliance. Up to the eighth or ninth year of childhood one may say that the child does hardly anything else than handle objects, explore things with his hands, doing and undoing, setting up and knocking down, putting together and pulling apart; for, from the psychological point of view, construction and destruction are two names for the same manual activity. Both signify the production of change, and the working of effects, in outward things. The result of all this is that intimate familiarity with the physical environment, that acquaintance with the properties of material things, which is really the foundation of human consciousness. To the very last, in most of us, the conceptions of objects and their properties are limited to the notion of what we can do with them. A 'stick' means something we can lean upon or strike with; 'fire,' something to cook, or warm ourselves, or burn things up withal; 'string,' something with which to tie things together. For most people these objects have no other meaning. In geometry, the cylinder, circle, sphere, are defined as what you get by going through certain processes of construction, revolving a parallelogram upon one of its sides, etc. The more different kinds of things a child thus gets to know by treating and handling them, the more confident grows his sense of kinship with the world in which he lives. An unsympathetic adult will wonder at the fascinated hours which a child will spend in putting his blocks together and rearranging them. But the wise education takes the tide at the flood, and from the kindergarten upward devotes the first years of education to training in construction and to object-teaching. I need not recapitulate here what I said awhile back about the superiority of the objective and experimental methods. They occupy the pupil in a way most congruous with the spontaneous interests of his age. They absorb him, and leave impressions durable and profound. Compared with the youth taught by these methods, one brought up exclusively by books carries through life a certain remoteness from reality: he stands, as it were, out of the pale, and feels that he stands so; and often suffers a kind of melancholy from which he might have been rescued by a more real education. From William James Talks With Teachers. The failure to engage children hands-on in the earliest years of their educations, will leave them almost forevermore, out of touch. T. W. Berry in his book *The Pedagogy of Educational Handcraft, 1912 wrote about the general school effect of manual work. Children who are dull at literary work are very generally bright when engaged in manual work, and this interest in what is done, stimulated by its attendant success, is reflected in all the School work. The accuracy and neatness of execution and artistic embellishment demanded in Handicraft is imitated in School work generally, so that the moral effect is very great. The variety of work, both as regards materials and nature of models, tends to make a pupil adaptable to varying circumstances, but always aiming at a high artist finish to a useful article. Not only is the direct influence of manual instruction great but the indirect is even greater. The correlation of studies widens the interest, inculcates the spirit of co-operation and interrelationship, and enables the pupil to express his thoughts not in words only but in models, which necessarily demand precision, thus developing a most useful habit. I could witness that sense of enthusiastic interest yesterday as my 7th, 8th and 9th grade students worked with hand planes attempting to make a smooth surface on a pine stump from the Eureka Springs Cemetery. Today our Clear Spring School upper elementary students (grades 4, 5 and 6) will made tiny desktop trashcans (a project they suggested related to their own efforts to reduce, reuse and recycle). 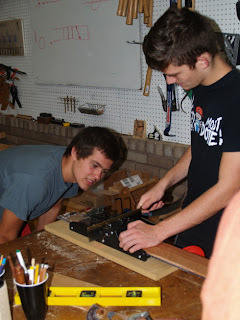 The high school students began work on computer carts to be used to keep their computers charged and ready for work. 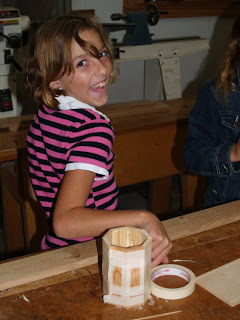 They also found planing wood to be fun and irresistible. 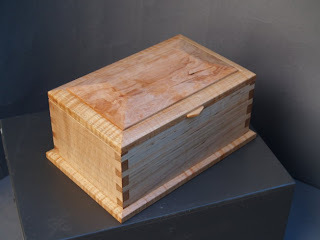 I am beginning work on two articles scheduled for Fine Woodworking, one on making wooden hinges for boxes, and the other on the installation of knife hinges for small cabinets. These are to be done ASAP, as one is already scheduled for an upcoming issue of the magazine. *The Pedagogy of Educational Handicraft by T.W. Berry is one of the books that came into my possession after being discarded by Bryson Library at Teachers College in New York City. It was passed along to me by a concerned librarian. The great irony of course is that Teachers College was originally conceived and founded to meet the the then growing need to teach teachers to teach Educational Handcrafts to our nation's kids. Their first building on their current campus was the Macy Manual Arts Building which was at one time filled with benches and machine tools. Sadly, those days are no more. "Education does not mean handing on parcels of knowledge to other people. It means kindling intellectual interests. Our aim in education should be to get a power of self-adjustment, to keep alive the spirit of adventure, to inculcate readiness to do drudgery, and above all things to form judgment and character. We need an education which opens the mind and trains the practical aptitudes; which inspires courage and fortitude, while also imparting knowledge and the scientific way of looking at things, and the scientific way of doing things; which opens new opportunities and at the same time cultivates the intellect and moral powers by means of which alone these opportunities can be seen and seized." Today at the Clear Spring School, the first, 2nd and 3rd grade students began making snakes as part of their study of local animal life. The 7th, 8th and 9th grade students began our project with the slices of tree trunk, marking our a time line of community history. Today we discovered that the tree from the library was 100 years old when cut. 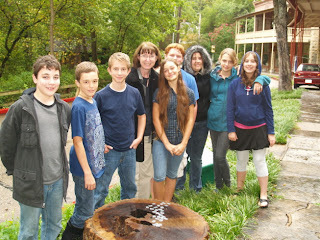 A large pine stump we are hand planing to make a table began its own life in 1900. The introduction of manual work into our schools is important, not merely from the advantage which would result to health, not merely from the training of the hand as an instrument, but also from its effect on the mind itself. There have been two very different points of view from which manual instruction has been recommended. The first looks at the problem from a especially economic point of view. The school is arranged so as to elicit the special aptitudes of the pupils; to prepare and develop the children as quickly and completely as possible for some definite trade or handicraft, so as to, if possible, assure them, when leaving school, the material requisite for existence. In this way it is maintained that the wealth and comfort of the nation can be best promoted. The second theory regards the manual instruction as a form of education; the object is to give the hand, not so much a special as a general aptitude, suitable to the varied circumstances of practical life, and calculated to develop a healthy love of labor, to exercise the faculties of attention, perception, and intuition. The one treats the school as subordinate to the workshop, and the other takes the workshop and makes it a part of the school. The one seeks to make a workman, the other to train up a man. To what Lubbock has mentioned, I will add the expression of educational enthusiasm. If you want kids to take a greater interest in their schooling, give them something creative to do with their hands. "...A Cornishman, John Chenoweth by name and a joiner by trade. He taught carpentry as a labour of love before the advent of a woodwork master. He kept that school like a new pin. Of course he had to put up with a good deal from the scholars, but I never knew him to chastise the worst of his tormentors. He would chase them, rarely with success because of a dragging foot, but when he did corner his quarry, a forceful homily, a twinkle in the eyes, a pat on the shoulder and it was over. A devoted Methodist, on Sunday he too turned teacher." 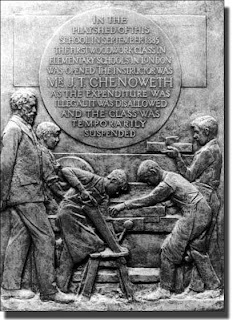 Thus Chenoweth, though nearly forgotten as have been most craftsmen of his era, lived on in the memories of a man who had a larger impact in greater things. Sir Harold Bellman grew up to become an author and leader in the Building Society Movement, and was director of the Abbey National Building Society. There is a strange inclination for some of those who have not had the opportunity to really make anything with their own hands. They may feel a longing for human creative capacity that they hope to fill with pretense, claiming "I built that," when the truth was that they only paid to have it built. The world we live in is the result of a collaborative effort with some getting a disproportionate share of the credit and reward. Labor day is a time to reflect on the unknown craftsmen, and those whose shoulders upon which we continue to stand. A reader, Tom, sent the following link to the etymology of the word surgeon.Would it surprise you that it might have something to do with the hands? Surgeon, "working or done by hand. "It seems like every surgeon I've met will describe in detail the necessity of learning hands-on. When John William Tate began his own experiment in offering manual arts in school, he was headmaster of the Beethoven St. School in Chelsea. Before his experiment he had offered counseling to his students and had noticed that nearly all were destined for jobs as clerks, book keepers and salesmen. He observed that the instruction of his school came nearer to "fitting a boy for the desk or the counter than for the workshop." Typically, along with those professions came a sense of scorn toward common tradesmen as being lower in social class and capacity. But as I reported in yesterday's post, Tate discovered that when children had the opportunity to explore their own creative capacities, they also discovered a sense of respect for those who take the time to cultivate skills in the manual arts. Tate, a gentleman in every sense of the word as you will read below, was inspired to purchase his own tools, build a workbench for his own use, and then attended classes in the manual arts to attain skills that he might better teach and set a better example for his kids.
" 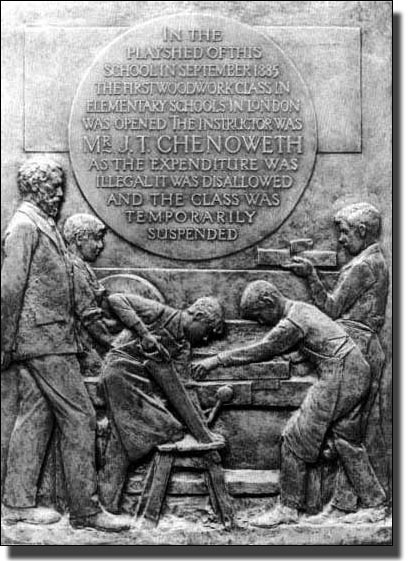 --- the present methods of teaching in our public elementary schools do not satisfy the wants of the nation, or do justice to the children who are compelled to attend---"
The small experiment in the Beethoven School brought important changes for a time in British education... We can hope for something similar to happen again in the US. 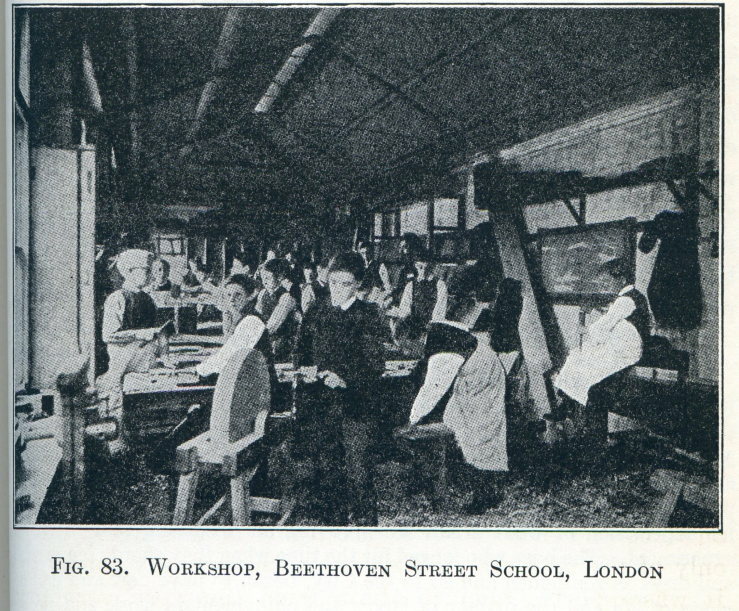 Mr. John William Tate, headmaster of the Beethoven St. School in Chelsea, London, 1885, described years later his introduction of a wood shop and its effects. He had realized his school was fitting kids out "for the desk or counter" and little else. So he added a roof to a small section of playground and began building tools and workbenches under the guidance of the school janitor who also had carpentry skills. The lads took to the work as ducks take to water. It was most popular. Even the caretaker* acquired a new dignity; he possessed a knack which they lacked; he was looked up to in a way that he had never been before. Meanwhile, I began making myself a bench and bought a new set of tools, and attended several courses of lectures and demonstrations with workshop practice at the City and Guilds of London Institute, thus qualifying myself for supervision of what I saw was proving an absorbing and interesting experiment. The boys who longed for the time when they should leave school and dress as gentlemen and go to the City, began to have new and enlarged views of life and the dignity of labor; and enjoyment in work and production took hold of their minds, especially when they saw several of the class masters eagerly bent in the same direction and working out of school hours in the workshop, which, whenever the door was unlocked, became a rendezvous for the favored elder boys who were privileged to enter its portals. I may say here that we never had the slightest difficulty with discipline. If a boy in the fullness of spirits was too exuberant and troublesome, it was enough for me to say to him that he had made a little mistake, that this was a workshop not a play-shop, and that, if he could not realize that fact, there were many boys eagerly waiting who would gladly fill his place. This always had the desired effect of sobering the boy, and I never remember having to go further. It is interesting what happens when teaching to do and teaching by doing takes root and takes hand. It also takes heart. School wood shops can still be transformational in the lives of kids. When children have an interest, as they will when allowed to do real things, real learning takes place that involves growth of character and intellect. And I say to the grownups, if you want to deny evolution and live in your world, in your world that’s completely inconsistent with everything we observe in the universe, that’s fine, but don’t make your kids do it because we need them. We need scientifically literate voters and taxpayers for the future. We need people that can–we need engineers that can build stuff, solve problems.